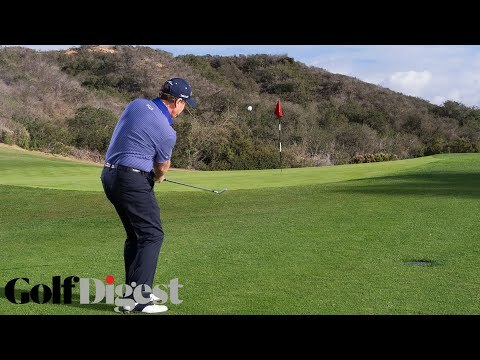 PGA Tour golfer Tom Watson shows Golf Digest two ways to play any type of short-game chip shot. and it has to do with the left hand grip. with two different left hand positions on the club. the middle, put the right hand over a little bit. making the ball go higher. you still have that little hip slide right here. Left hand right down the top. Ball goes up in the air. what I’ll do, I’ll strengthen it even more. here with my hips, like this. but watch it roll now. to get on the green and run.